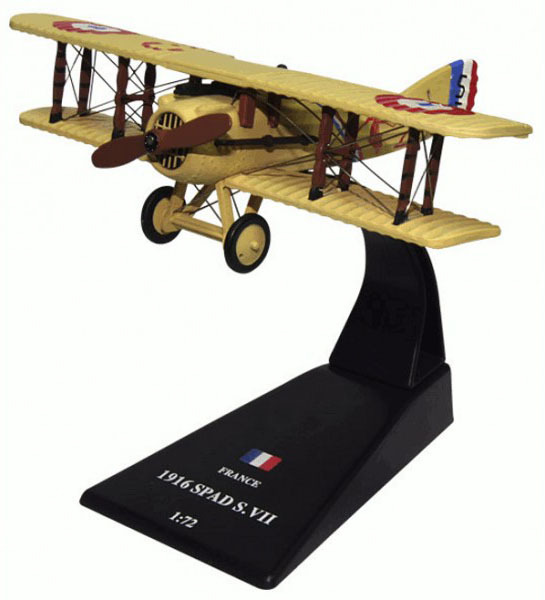 The SPAD S.VII was the first of a series of highly successful biplane fighter aircraft produced by Société Pour L'Aviation et ses Dérivés (SPAD) during the First World War. Like its successors, the S.VII was renowned as a sturdy and rugged aircraft with good climbing and diving characteristics. It was also a stable gun platform, although pilots used to the more manoeuvrable Nieuport fighters found it heavy on the controls. It was flown by a number of the famous aces, such as France's Georges Guynemer, Italy's Francesco Baracca and Australia's Alexander Pentland. Attention! Scale models specified by the manufacturer is not true! The sheer scale - 1/56!